Other Products by Swole. Search other Protein Shakers products. 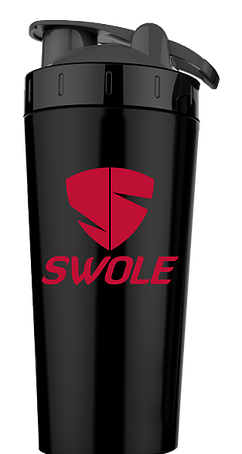 Mixing protein shakes and amino acid formulas has never been so high-tech as with the Swole Stainless Steel Shaker. With a convenient measuring window built in to the side of the container, you can be sure to always get your fluid measurements perfect. One of the most frustrating parts of all shakers is the fact that so many of them do not adequately seal. However, the Swole Stainless Steel Shaker has a lock-on lid to ensure that all of your drink ends up where you want it—in your mouth, and not on your shirt. With a solid 700ml capacity, you can mix hydration formulas for endurance, or mass powders for gaining programs. This is a versatile shaker that also ensures that your exposure to plastics is reduced, with the use of stainless steel materials. This is a trendy and stylish shaker that makes protein shakes and intra-workouts feel like a new experience.